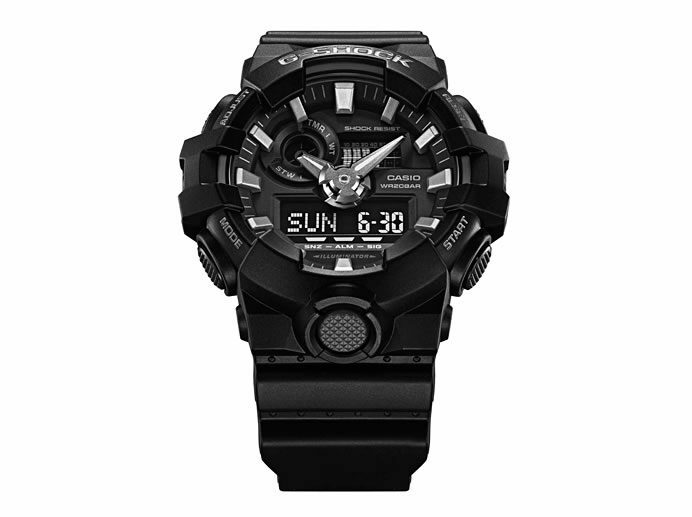 Casio released today GA-700, the latest addition to its G-SHOCK line of shock-resistant watches. The new Casio GA-700 features a muscular and multidimensional shape that fully embodies the toughness of G-SHOCK watches. The multidimensional design comes across in everything from the rugged bezel, tough button guards, and bold front button to the index marks, dial, and the edges surrounding the multiple LCDs. The dimensional hands are molded using original Casio resin molding technology, which lends a rugged quality to them, almost as if they were chiseled from metal. The GA-700 delivers an array of features for the ultimate in usability, with the Super Illuminator white LED light for visibility in dim light, hands that shift out of the way for easy viewing of the LCD display, and technologies that deliver battery life of about 5 years. The black and red color scheme employs the G-SHOCK brand colors, evoking the passionate spirit of the G-SHOCK brand. The GA-700 features a muscular design that embodies the toughness of G-SHOCK watches, highlighting a bold aesthetic.